This post originally appeared on Dollycas’s Thoughts June 18, 2011. This is the third installment featuring James Becker (Beck), a former Military Intelligence Agent and his ex-CIA code cracking, computer expert wife, Beth. They are both retired from their stressful jobs, Beck does some work as an attorney now, but they just can’t seem to stay out of trouble. In this edition the Mexican Drug Wars come way too close to home, very near to their quiet Minnesota community, and they aren’t just selling the drugs, they are manufacturing meth at a huge grain company. The organic grain elevator and small dairy is a great cover. The CEO doesn’t even know what is happening right under his nose. To add even more thrill to this thriller we find out about some of Beck’s friend Bull’s past. A friend from his time in the military shows up and he is on a mission and wants Bull’s help to carry out his plan. He has set up his planned assault for many years and it is all coming to a head now in Minnesota. Beth and Beck try to help their friend Bull accomplish his friend’s mission in the most legal way possible because if they don’t they could all end up in jail or dead. I was privileged to be one of the first to read the first book in this series, The Missing Element and then The 19th Element which tied with Harlan Coben’s CAUGHT for my selection of Best Suspense/Thriller for 2010. 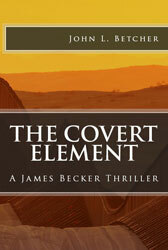 I was worried that after the last one John had set the bar too high for himself, but The Covert Element surpassed both of the previous novels. I think that John is not only a brilliant writer but he takes huge current issues in the world and brings them alarmingly close to home. He had made Red Wing, Minnesota the hotbed of some critical world issues in a truly believable way. I just hope the wrong people don’t read his books and get ideas. The dialogue between Beck and Beth is so real. I know some critics have panned their romance and relationship taking too big of part in these stories, but to me it makes the stressful situations even more real. There is less of that in this installment but you still see and feel the calming effect Beth has on Beck. Without that he could develop quickly in a character out of control. She is a vital character and their strong relationship is a huge part of why these stories work. You can see the author takes great pains in his research in every one of the books but this one took intense investigation to get the facts right to make this story credible. It continues his “ripped from headlines” style. This is yet another book by John L. Betcher I recommend you click the link below and order today. You will be enthralled from the first page until the very last and you won’t be able to wait and tell your friends they have to read it too!!! Well done John!!! Now get to work on the next one!!! By hot little hands are waiting!! !